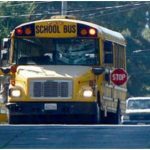 School buses will soon roll out across Seattle. Here’s a review of what to do when their red lights flash. Always stop, regardless of the number of lanes. Never try to pass on the right, since that’s where kids are loading and unloading. Stop unless the road has three or more lanes (at least one in each direction, plus a center turn lane) or the lanes are separated by a physical barrier or median. Once the red lights come on, you need to stay stopped until the bus driver turns them off. Thanks! I didn’t know about rule 2.